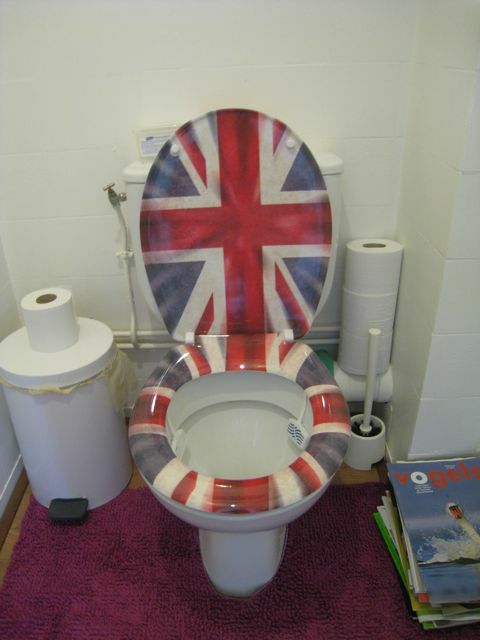 Who would ever consider getting a toilet seat with the Dutch flag? Exactly: nobody. So why is it different with the UK flag? Because it’s Punk? Or Burberry? Or Harry&Kate? Hm, I wonder how my British friends like our purchase..
After a day in the countryside I came back to Geneva to discover my bike had a flat tire. A bummer, because I live 11 km from the city and it was already getting dark. Still sparkling from the lovely day I’d had, though, I started to walk home. He introduced himself as Hector. He was originally from Mexico, working as a sculptor in Geneva. “Your skin is beautiful,” he said while tearing a wheel from his bike, “like ceramics”. I protested vehemently against his offers and asked if he had a pump I could use? “Oh Luce,” he said dreamily, “we can go biking together” . Hector had a pump and a tire repair kit. He seemed shocked at the idea that I knew how to repair my own tire and insisted on using all his glue to patch the tube. But it worked. I thanked Hector, who thanked my bike for bringing us together. “It’s magic,” he concluded. And when could we meet again? “I could be your cat,” he suggested, “you would only have to pet me occasionally”. I blew him a kiss. “At least let me be your bicycle repair man!” he pleaded. With my bike fixed I very much enjoyed my ride home. We all need to meet a Hector once in a while.